It's hard to imagine, but the land that is now Glendale was at one time nothing more than desert land — not capable of growing food or sustaining human life. Other areas like Phoenix, Tempe and Mesa had already begun homesteading activity due to redirection of creeks and Native American irrigation techniques. 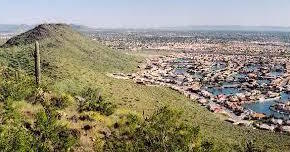 That all changed in the late 1880's with the advent of the Arizona Canal, which led to the founding of several communities in and around the Phoenix area. The construction in the 1930's of Hoover Dam, which borders Arizona and Nevada, also benefited Glendale, as the dam provides electricity and water needed for irrigation to communities throughout Arizona. Glendale of today is a bustling city on the outskirts of Phoenix with a population of more than 226,000 that is home to several professional sports teams, one of which will be host to the Super Bowl in 2015. Neighborhoods in Glendale are well-designed and homes are close to schools and well-irrigated parks. There are several gated communities that provide a degree of extra privacy and security. People also stay in Glendale, a city where more than 96 percent of residents are homeowners and the median stay in homes has averaged seven years. Glendale has its own Municipal Airport, and is home to Luke Air Force Base. The city has also been approved for light rail service to and from Phoenix, which will be up and running by 2026. The Glendale of today is far removed from the dry and barren 1800's, but the city still values its history, with a marker for William J. Murphy, the man who spearheaded the Arizona Canal's construction before founding Glendale, at the intersection of North 58th Avenue and West Glendale Avenue. There is also a historic "Old Town" districtwhere the pace is slower and shoppers can walk about older buildings with brick facades that house antique shops, candy factories, boutique hotels, and an eclectic assortment of restaurants. Glendale has been dubbed "Arizona's Antique Capital" by several local and national publications, so antiquing in Old Town is a pastime that many enjoy. There are also plenty of shopping and dining opportunities at Westgate City Center, where people can shop for clothing, health and beauty items, electronics, accessories and more. Westgate is also home to the AMC Westgate 20 movie theater, Tully's Coffee Shop, and Coldstone Creamery. Arrowhead Towne Centeris another great mall with tenants like Macy's, Sears, Dillard's, JC Penney, and Lenscrafters. Wal-Mart, Home Depot and Lowes all have stores in Glendale. While there abundant supply of restaurant choices at the malls, many prefer the truly local fare and the barbecue they will find at Thee Pitt's Again, an award-winning barbecue spot located on West Bell Road. The popular Italian restaurant Tutti Santi Ristorantealso has a spot in Glendale — reservations are recommended. There really is a smorgasbord of restaurants of all food cuisines in Glendale from American to Vietnamese cuisine at Little Saigon, Polish cuisine at A Touch of European Café, and delicious Thai food at Siam Thai Cuisine Restaurant. A full listing of local restaurants can be found on the Glendale Chamber of Commercewebsite. Glendale has an abundance of outdoor parks and plenty of activities for residents and visitors to take part. The town operates a total of 15 parks, some with skate parks, dog parks and other amenities. The "Crown Jewel" of the local park scene is Sahuaro Ranch Park, which features historic ranch houses amidst a recreational park area. Chickens and peacocks roam the grounds while children enjoy playground activity and others engage in a game of softball. Picnic tables and grills are available on a first come, first serve basis. Dogs can romp and play at an adjacent dog park. At the same time, those wanting an outdoor activity that doesn't take much effort might take in the WaterDance Plazaat Westgate City Center. The water show, designed after the show at the Bellagio Hotel in Las Vegas, features water effects, songs, and visual imagery. The Plaza setting has also hosted concerts by the likes of Jimmy Buffett and American Idol viewing parties. With the National Hockey League's Phoenix Coyotesteam calling Glendale home and making it to the Stanley Cup Finals for the first time, Glendale was abuzz with hockey fever. Add to that the fact that the University of Phoenix Stadium was the location for Super Bowl 2015, and you can see what role local teams play in the Glendale community. With an abundance of trails and great weather most of the year, Glendale residents take advantage of outdoor activities. There are some parks that allow bikes and others that are great parks to ride to. Thunderbird Conservation Parkfeatures more than 20 miles of single track trails in a local conservation area for bikers to share with hikers. For those that prefer a paved ride, Thunderbird Paseo Parkhas four miles of paved bike paths, along with a playground for children. The Glendale Adult Centeroffers activities for adults of all ages including exercise, billiards, surfing the internet, or just having coffee with a friend. Neighborhood block parties are sanctioned by the city, just as long as signatures from 90 percent of the people on the block are attained. K-8 grade students attend one of 17 elementary schools within the Glendale Elementary School District. High School students attend one of 11 schools within the Glendale Union High School District, and summer school is offered to any students that want to earn units over summer break. Glendale Community Collegeis a destination for students wishing to take their lower division courses before transferring, as well as to adults looking to take a class for enjoyment. Glendale is also home to Midwestern University, the first medical school in the Phoenix metro area, and the Thunderbird School of Global Management, an international post-graduate international business school. Healthcare is readily available in Glendale with several hospitals and urgent care centers on duty in case of emergency. Banner Thunderbird Medical Centeris an 890,000 square foot acute care facility with 513 licensed beds. It has been noted by U.S. News and World Report as being one of the top hospitals in the Phoenix metro area. Banner is the fourth largest hospital in the Phoenix area. Abrazo Arrowhead Campusis a 217 bed facility. The hospital is an Accredited Chest Care Center and has recognized as a member of Arizona Primary Stroke Center. Both hospitals operate emergency rooms. Valley Metrooperates a healthy public transportation service in and around Glendale. Local bus routes are available daily as well as commuter routes into and out of Phoenix on a regular basis. Valley Metro also sponsors bike and pedestrian projects to get people out of their cars. To work with a team experienced with listing and selling Glendale Residential Real Estate contact Tony & Suzanne today!